Unlike other companies, you’ll experience a magical reindeer sleigh-ride through the snowy woods, and a sled-ride with the huskies at no extra cost. As well as a snowmobile sleigh-ride and fun and games with the elves. However, believe it or not, there’s still time to try even more wonderful activities which can be added to your booking in advance. Have a look at some of the adventures you will have the opportunity to do and choose something the whole family will love. Of course, the number one activity for all families is the chance to meet the big man himself, Santa! You and your family are guaranteed a private family meeting with him in his log-cabin. We have a lot of adorable pups and fully-grown dogs in Lapland. Fuzzy noses, cuddly warmth and the occasional lick is all part and parcel of living with these beautiful beings. Fun for Mums and Dads, as well as Grandparents, they can have a go at driving the sled if they want to. You children can sit back and enjoy the ride! Need a bigger sleigh? You’ll need a bigger animal. We might keep Rudolf, Dasher, Dancer, Prancer, Vixen, Comet, Cupid, Donner and Blitzen busy training for Christmas duties, but they always have a moment to take you for a ride! 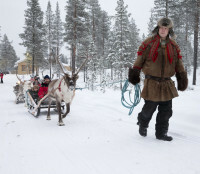 A reindeer-drawn sled really is my all-time favourite way to travel. 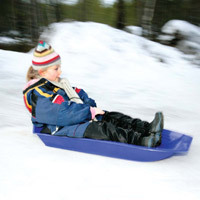 We have seen many of the traditional Lappish folk taking part in tobogganing for years! It’s a real treat to have a go in its classic home. It’s not only a treat for the children, but we often see Mum and Dad having another go when you’re not looking! Keep an eye on them! 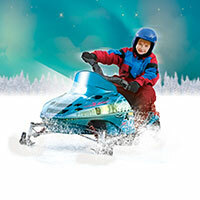 This activity is a lot noisier than the others, but with the skidoos being specially designed to be safe for younger visitors it is definitely a novel activity and something a little different. We don’t get much television signal out here in the Arctic Circle, so we play many of the sports ourselves! 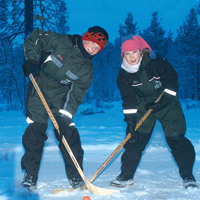 It’s great when we have new visitors to Lapland who want to join in for a round of Snow Hockey. We’ll warn you though, we Elves are very competitive. Challenge us and let’s see who will be the ultimate winners! We don’t keep the fish we catch, we let them go again! But have a go casting your line in the frozen lake we have here in Saariselkä. It’s a traditional Sami (the native Lapps) art. It requires much patience and can be a wonderful way to relax.